There are certain flavor combinations that I can’t get enough of and a garlicy blend of mushrooms and spinach is one of them. This pasta with mushrooms and spinach is a fragrant and earthy blend – the perfect topping for pasta. It’s a quick and flavorful dish – easy to put together in under 30 minutes. The mushrooms are sautéed with garlic and scallions and turn a golden brown. Next, the fresh spinach is sautéed with more garlic and a touch of lemon is added for a little lemony punch. This is not a heavy or oily dish. A light sprinkle of parmesan added to the hot pasta and mushroom spinach mixture marries everything together. Do all your prep work first – wash the spinach and mushrooms, chop the scallions, mince the garlic, grate the cheese, squeeze the lemon, measure out your pasta. The key to making this dish in under 30 minutes is to have everything ready to go before you start cooking. Cook your mushrooms over medium high heat. You want them to be a golden brown color. If you cook them over low heat they won’t take on any color – so keep the heat on medium high. If you can, use freshly grated parmesan – it really makes a difference in this dish. There are two advantages to freshly grated parmesan – one it taste great and two it completely melts into the dish. 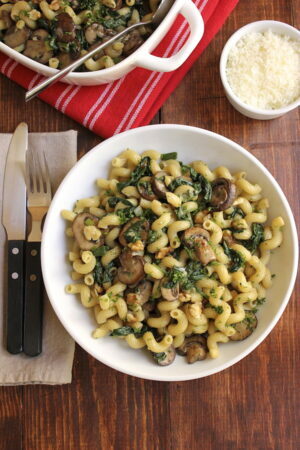 Pasta with mushrooms and spinach. A fragrant and earthy combination served over pasta. Cook pasta according to package instructions. Add bouillon cube to water once the water begins to boil. While pasta is cooking, heat a sauté pan over medium high heat. Add 1 tbs of oil – let oil heat up – and then add the sliced mushrooms. Do not stir the mushrooms – let them cook over medium high heat for 3 minutes. You want the mushrooms to brown. After 3 minutes, stir and add 2 cloves minced garlic and sliced scallions. Continue cooking over medium high heat – stirring occasionally for 3 more minutes until mushrooms are cooked a golden brown. Remove mushrooms from sauté pan and add to a large bowl. Add 1 tbs olive oil to sauté pan (same sauté pan used for mushrooms). When oil is heated through, add spinach (a large handful at a time) and sauté until wilted – about 1 to 2 minutes. Add 2 cloves of minced garlic and lemon juice to spinach and cook stirring for 1 minute. Add spinach to mushroom mixture in bowl. When pasta is ready, drain pasta but keep 1/2 cup of pasta water to the side. Add pasta to the spinach and mushroom mixture and stir to combine. Sprinkle a 1/4 cup of parmesan cheese over mixture and stir to combine. Add walnuts and parsley and stir to combine. If the pasta seems dry then add some of the reserved pasta water – a little bit at a time. Serve with the remaining 1/4 cup of parmesan cheese on the side – to sprinkle over the top of each dish. Thanks so much, Robyn! I appreciate it. A lovely vibrant pasta to eat on a summer evening, delicious! Thanks, Mom!! Glad you liked it.